Tagging files in your iTunes library—entering the correct information regarding artists, albums, song names, genres and more—helps you find the music you want to listen to, and create smart playlists. And album art gives you a visual reminder of what you listen to. In this installment, I’ll address questions about tagging basics, removing artwork, adding large descriptions in tags, and more. I know it’s pretty basic to a lot of iTunes users, but I don’t totally understand the concept of tagging. Can you enlighten me? 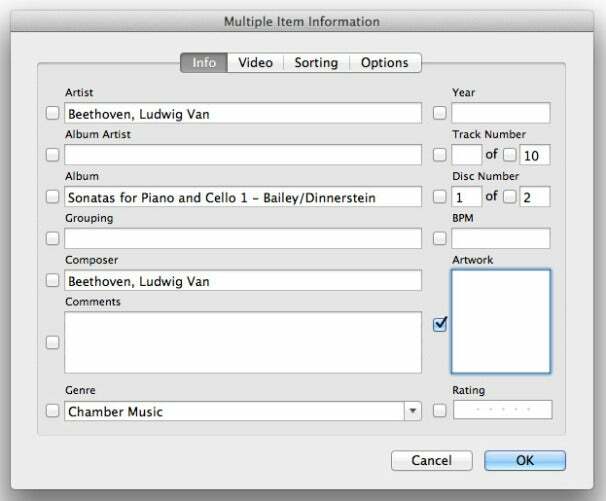 Tags are what makes each track or video different from others, at least when you view your iTunes library on your computer or iPhone, say. There’s no voodoo involved; tags include such things as the name of a song, an artist, or an album; track number; and genre. 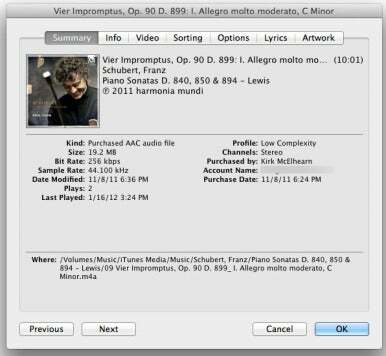 There are a number of other tags that tell iTunes to do certain things, such as skip files when playing in shuffle mode, for example. You can see many of the tags in the Summary pane of the Info window for any track. At the top is the name of the track, then the artist, then the album. At the bottom are many of the other tags that provide information about the track. There used to be a “Has Artwork” option for smart playlists, but I can’t find it any more. Can you tell me where it’s gone? It’s still there, but you access it in a different way. Create a smart playlist with Album Artwork in the first pop-up menu and Is True in the second to see which tracks have artwork. Alternately, if you want to see which tracks are missing artwork, choose Is False from the second pop-up menu. How do I delete album art from a group of, say, 25 songs? This album art was previously pasted in the Album Art window. I do this a lot when upgrading the album art but I never saw the need to have more than one cover on a song. This is quite simple. Select all the files, then press Command-I. You’ll see an Artwork well near the bottom-right of the window. Check the box next to this well, then click OK. This will delete all the art—even if there are multiple covers—for the selected tracks. Check the box next to Artwork, then click OK, to remove all artwork in the selected tracks. While you’re at it, if you want to replace artwork for multiple files, go to the same window, then either drag a file into the artwork well or copy and paste an image (copy it, click in the well, then press Command-V). I frequently record a radio show that is often five or more hours long, but I don’t always listen to it all at one sitting. Once I start it, I find myself trapped to some extent because if I try to listen to anything else, then I’ll lose my place in the radio show. Is there some way I can save the place in this recording so I can stop, then listen to music, and come back to the radio show at the point I left off? Yes, there’s a simple way to do this. Select the file from within iTunes, choose File -> Get Info or press Command-I, and click on the Options tab. There you’ll find a Remember Playback Position option. Check the box next to those words and click OK.
Not only will iTunes remember where you left off, but if you sync that track to an iPod or iPhone, you can pick up from that point on your portable device as well. Each time you sync, your current place gets synced as well. I’m one of those people who wants to add as much info as possible to tracks in my iTunes library. I also have a lot of live concert movies. Not only would I like to add personnel, but the set list as well. 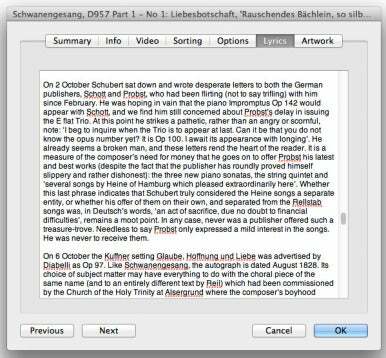 One can add comments to music tracks, but there is a character limit. Is there a may to add more information to video files? As odd as it seems, your best bet might be to use the Lyrics tab. It holds approximately 24,800 characters, which should be more than enough room for your needs. You’re free to add pretty much all the information you want in that tag. You can put very long texts in the Lyrics tag. There are many songs that need to be linked together so they play back correctly, even when in shuffle mode. For example, The Allman Brothers’ “Don’t Want You No More” segues into “It’s Not My Cross to Bear.” How can I make sure to play the two songs together? The best way to do so is to join the tracks when you rip a CD. To combine tracks, select the files you want to join and choose Join CD Tracks from iTunes’ Advanced menu. iTunes will place a bracket next to the tracks that will be joined when you click Import CD. I do this often, especially for such Grateful Dead staples as “China Cat Sunflower” and “I Know You Rider”, which segue into each other and are really just one long song. If you’ve already ripped the tracks, you can use Doug Adams’ free Join Together, to join tracks you’ve already ripped. Be sure to read the instructions, as some of its functions are limited under OS X 10.7 Lion.